We've got all your Christmas tree needs! 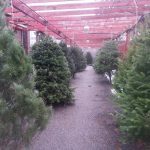 Start by picking from a wide variety of trees and sizes ( Fraser Fir, Balsam, Noble etc.) Then pick out one of our guaranteed tree stands (or bring your own) so that we can give your tree a fresh cut, stand it straight, bag it and help you load it up! Make Tumino's your only Christmas tree destination!